It starts around 4:45 PM in my house. First it’s, “Can I have crackers?” About ten minutes later, “I need yellow cheese.” And then soon after, a breaking point is reached. 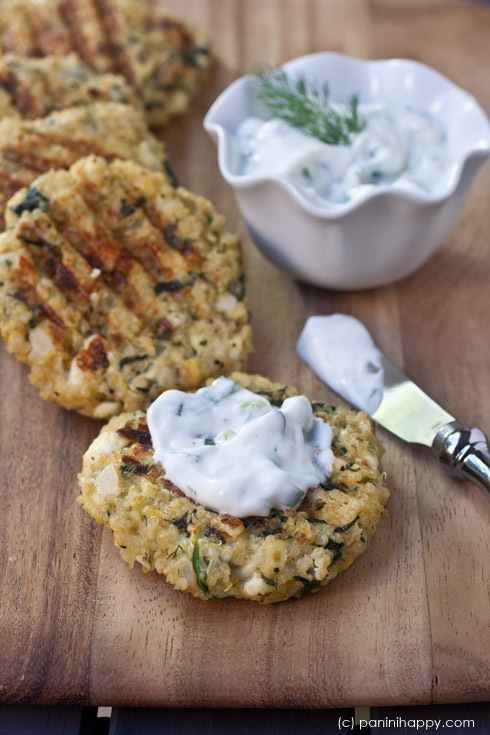 Spinach-Feta Quinoa Cakes with Lemon-Dill Yogurt Sauce is one of many healthy dinners I’m able to pull together in about 35 minutes with the help of my panini press. These savory grilled quinoa cakes take on the zesty flavors of a classic Greek spanakopita. Quinoa, as you may know, is a high protein “superfood,” so these cakes are just as good for you as they are delicious. They crisp up well on the grill, so there’s no need to sauté them in oil. Add a few dollops of cool lemon-dill yogurt sauce and you’ve got a tasty light meal. My panini press is my secret to getting quick meals on the table several times a week. It’s stationed right on my kitchen counter most days, ready to quickly grill meats, seafood and vegetables. As we know, the panini press – or any tabletop grill – heats food from both the top and bottom at the same time, so it usually takes less time to cook than other methods. Also, many presses (including the ones that I use) come with a drip tray, so when I grill the excess fat drains away. 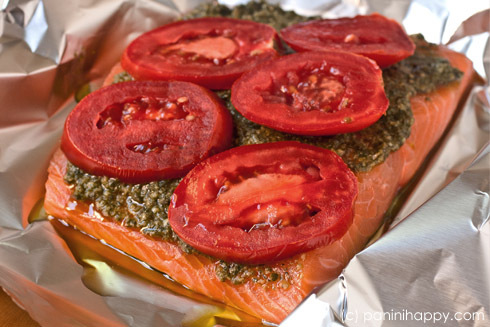 Not only is Foil-Grilled Salmon with Pesto and Tomatoes a quick meal – the salmon grills in just 10 minutes – but since you grill it in a foil packet there’s also virtually nothing to clean up. Definitely one of my favorites! 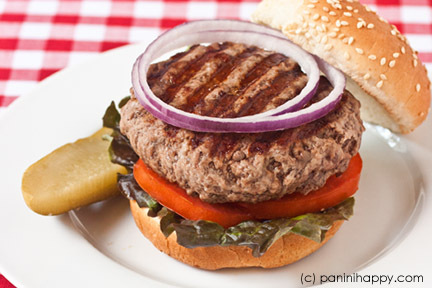 In the wintertime, when it’s too cold to barbecue, use your panini press to grill juicy Hamburgers. The excess fat drains away and you don’t even need to flip them. Win-win! Shrimp is one of my best weeknight dinner secrets, whether or not I’m cooking with a panini press. 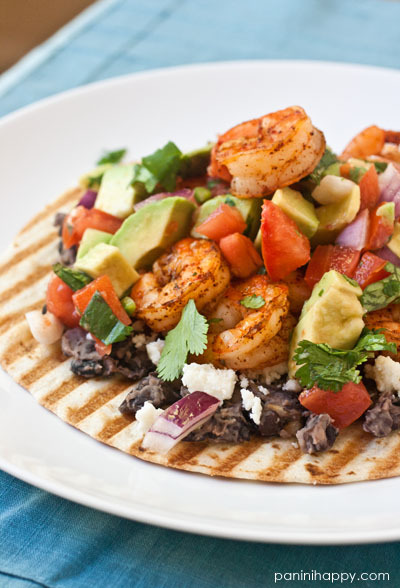 You can grill half a pound of shrimp on the panini press in about 90 seconds! Hence, I always keep a bag of them in the freezer – ready to make Grilled Shrimp Tostadas with Avocado Salsa Fresca at any time. 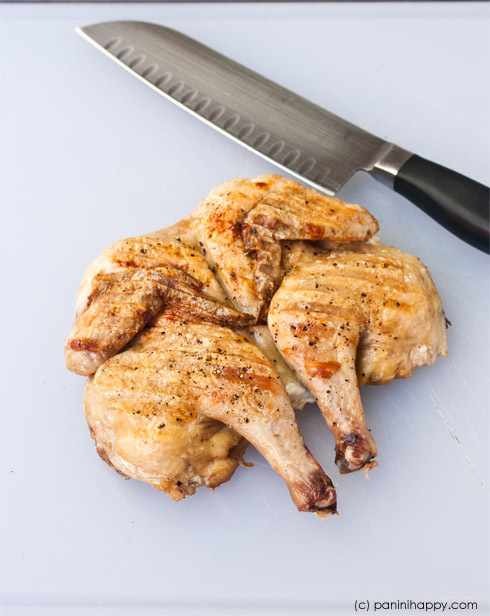 You can even grill a whole chicken on the panini press, if the chicken is a Cornish game hen and you butterfly it to lay flat (aka, spatchcock). With heat from both sides on the press, you can grill Spatchcocked Game Hen in about half the time it would take to roast it, under 20 minutes. Let boneless, skinless chicken thighs soak in a sweet and salty marinade, and put rice on to cook while you attend to other things around the house. 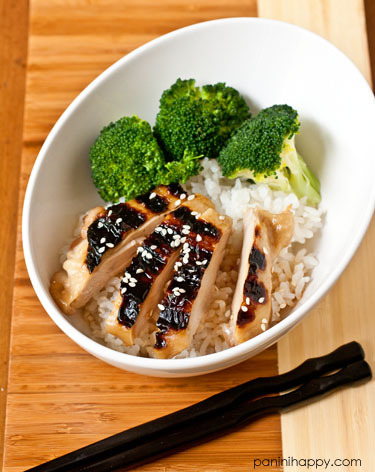 Then, once it’s time to grill, Chicken Teriyaki takes just minutes on the panini press. These are just a handful of ways that your panini press or tabletop grill can help you get weeknight dinner on the table quickly. If you can roast, fry or bake it, chances are you can grill it on the panini press – quicker and maybe even healthier. Whisk together the yogurt, scallions, lemon juice, and dill in a small bowl. Season to taste with salt and pepper. Cover and refrigerate the sauce for at least 1 hour to allow the flavors to meld. Add the eggs, quinoa, feta, dill, lemon zest, and black pepper and mix well. Mix in the bread crumbs and let the mixture sit for a few minutes to allow the bread crumbs to absorb some of the moisture. Heat the panini press to medium-high heat. Form quinoa patties about 2 1/2 inches in diameter and 1/2 inch thick. Place the patties on the grill, in batches if necessary, and close the lid. Grill the patties until they’re cooked through and browned on the outside, 4 to 5 minutes. Serve warm with lemon-dill yogurt sauce. 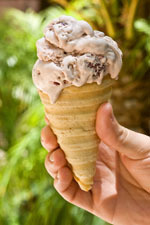 This post is part of BlogHer’s Dinner, Faster editorial series, made possible by Land o’ Lakes. Grilled Potatoes Anna…and San Diego’s Brooklyn Girl! I really love quinoa cakes. I love these flavors, Kathy! Those quinoa cakes sounds heavenly! Terrific – I hope you like it, Cherie! If it’s got feta in it I’m a happy girl! Love this! I have a bunch of quinoa and was looking for something to do with it! Bet I could sub some of the other greens I have around for the spinach? Sautéed kale would be great in there! I make quinoa patties all the time, but I usually bake them in the oven. The fact that these only took you 4-5 minutes on the panini press is awesome–I think this is how I’m going to make mine from now on! Definitely give it a try, Kiersten! wow i would have never thought to use a panini press for so many things are than a panini! amazing! I will have to try some of these! the salmon and chicken look awesome. Yum! Love all of these creative ideas, Kathy! Quinoa cakes have always been on my to make list. 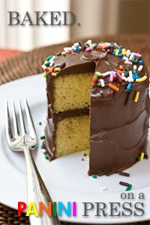 This looks like the perfect recipe to try! Yum! I love all these. And who doesn’t love a nice quick dinner. sally @ sallys baking addiction´s last blog post ..red velvet cheesecake swirl brownies. Omg I loooove Quinoa cakes sooo much. This combination looks amazing, and I am pinning to try ASAP! Thanks!! Allyson´s last blog post ..Heart Shaped Brownies….Pinterest FAIL! Hi – Silly question – do you cook 1 1/4 cups of quinoa or do you cook less so that you have 1 1/4 cups once it’s cooked? Thanks! Hi Elise – Yes, you need 1 1/4 cups *cooked* quinoa for this recipe. Just like rice, quinoa expands as it cooks. So you’ll need to start with somewhere around 1/2 cup to 3/4 cup *uncooked* quinoa. The exact ratio varies across quinoa brands so you’ll want to refer to the cooking directions on the package. If you don’t have a panini press, would you recommend baking them or pan frying? Or a little of both? :). Thanks. Don’t know what we did wrong, but these stuck all over the panini grill, fell apart and we’re now cooking them in a skillet… The panini grill will take awhile to get clean! Hi Laura, I’m sorry to hear they fell apart on you. I’ve made them several times and they’ve always remained intact. Without seeing them I can’t say for sure what went awry but it’s possible that your quinoa cakes weren’t quite cooked enough when you opened the grill. Just like when you’re grilling burgers or fish on the barbecue, if you go to move them too soon they tend to stick. All panini makers heat differently – it’s possible that it takes a little longer to cook on yours than it does on mine. These sound so good, and I love the idea of Cornish game hens on the panini press. Hi, could I make these ahead of time ? Are they nice at room temp or cold? thanks! Hi Kylie – I personally prefer them served warm, but they do reheat well. Is there way to make these without the egg? Sounds so good but my husband can’t consume them.. These were great! I made a tzatziki sauce with dill instead since I’m making gyros this week (also mixed some with tuna for a spin on tuna salad sandwich). Instead of sauteing the onions and garlic I added them into the quinoa when I was cooking it to avoid dirtying another pan. I also added a veggie broth bouillon to the quinoa to up the flavor. Everything else I did the same. I had a slight issue with sticking but I think it was more so a need for more pam spray. Finally made the Spinach-Feta Quinoa Cakes last night – OMG!!! delish!! Now I want more recipes like this one – can see myself cooking on my Griddler every night!!! Thanks for the recipe…. That’s so great to hear, Phyllis! I made these tonight and they were delicious! I don’t have a panini press so I baked them at 350 for 25 minutes and they were perfect. Thank you!! Thanks for the recipe. These were a big hit at a potluck dinner. I need to eat gluten-free so I used gluten free bread crumbs. i fooled around with it a little due to what i had on hand. skipped the dill because i didn’t have any. added a little red pepper flake and made guacamole with greek yogurt, a little onion, salsa to top it. it was a real hit! i fried mine in a little olive oil. i used my 1/4 cup measuring cup packed in the mixture and it plopped out into the pan beautifully. then gently flattened it out with a spatula. they looked very uniform. my husband thought they were store bought (HA!) i got 9 patties from the recipe. a nice base recipe that can be experimented with! Do you think I could make these the day before ans keep them in the fridge and put on the panini press the next day? Hi Lavens – I haven’t made them ahead before, but I think it should work. My only concern would be the eggs, but judging from this chart (http://www.foodsafety.gov/keep/charts/eggstorage.html) things should be fine if you’re just refrigerating them overnight. These were excellent! Thanks so much for the recipe 🙂 They were a great way to use up the feta I had in my fridge. And my boys loved them. Naomi´s last blog post ..A Day at the Lil’ Monkey’s Treehouse Play and Discovery Center! I’m so glad to hear it, Naomi! I made these quinoa cakes today. Oh my. I LOVE them! I don’t have a panini press so I used my George Forman grill. Worked perfectly. Thanks so much for sharing this recipe!!! I’m so glad you liked them, Susie!! Next post: Dark Chocolate Sweetheart Panini…plus a Sweet Giveaway!